Great writing and tons of humor make this stick-figure RPG a hootin' n' shootin' good time. The turn-based combat isn't the best, but it's a delightfully written RPG absolutely packed with humor. What is it? An open world RPG comedy western with turn-based combat, a lot of hats, and ghost pickles. Welcome to the Old West, where snakes are used as whips, cattle are demonically evil, and alongside stick-figure cowboys there are goblins, necromancers, and ghosts. A lot of ghosts, actually. There are ghost horses—I ride one myself—and ghost cowboys, and an entire quite literal ghost town. There are even ghost pickles, and they're not the strangest things, or even the strangest food, you'll encounter. West of Loathing, the single-player comedy RPG from Asymmetric Publications, makers of browser-based RPG Kingdom of Loathing, is goofy and funny and wonderfully written. You should slip into your favorite ghost pants—you'll find a pair of them in the game—and head out west. After choosing from one of three character classes—the magical Beanslinger, the smooth-talking Snake Oiler, or the rough-and-tumble Cowpuncher—you'll mosey through tiny towns, gang hideouts, and ramshackle homesteads, picking up quests that add new spots on your map to visit. Once you've acquired a horse, each time you travel you'll have a random encounter: maybe you'll find a supply cache, meet a salesperson, get into a fight, or discover a new location to investigate. Soon your map will be crowded with towns, mines, caves, forts, homesteads, landmarks, and other areas of interest, like a jelly bean museum, a circus, or a Daveyard (which is like a graveyard, but only Daves are buried there). Some locations aren't fully accessible at first—for instance, one smells too foul to investigate until you have an item that affords you stench protection. Early on you'll come across machinery you can't fix and safes you can't crack, so you'll be crisscrossing the map and revisiting certain areas repeatedly. It's a real town and not a fake one. This is a funny game, and you'll want to root out every last shred of humor before you're done with it. That's fine, though, because there's lots to do and these areas are almost always rewarding to fully explore: just about everything you see has some utility. Flush a toilet for an XP gain, search a haystack for a needle or dig through a mine cart for a hunk of meat ore (West of Loathing has a meat-based economy), and insult yourself in a mirror to gain a combat buff because you angered yourself so much. Most importantly, sticking your nose in every corner of West of Loathing isn't just beneficial for improving your character's stats and filling your bottomless inventory with weapons, garments, food, hooch, and hats (there are over 50 of them!). This is a funny game, and you'll want to root out every last shred of humor before you're done with it. There are branching text conversations with a cast of oddball characters that are almost always entertaining, and everything from item descriptions to menu options are fun to read, like the one that lets you toggle the font to Arial (while asking at the same time that you not do that, please). The writing is sharp and clever, and as someone who typically hammers whatever button lets me skip conversations in RPGs, I found myself in the rare situation of not just reading every word of Loathing but actively searching for more. As you earn XP from just about every activity you perform, you'll gain a host of perks and skills (accidentally bumping into cacti gave me an attribute called Mostly Scabs), your liver and spleen capacity will increase (allowing you to drink more buff-giving potions and liquor), and you'll gain muscle, mysticism, and moxie (the last of which helps you shoot for more damage and take less from enemy bullets). You can acquire negative perks as well—there are some dark forces at work in West of Loathing, and how deeply you investigate them determines how much they damage your character. I investigated pretty darn deeply, and as a result my hair is bone white, my eyes are cloudy, and my body is thin and gaunt (even for a stick figure, I guess), all of which penalize my stats. On the plus side, I have some useful arcane enchantments I can perform, as every cowgirl should. Well, the bounty said dead or alive. 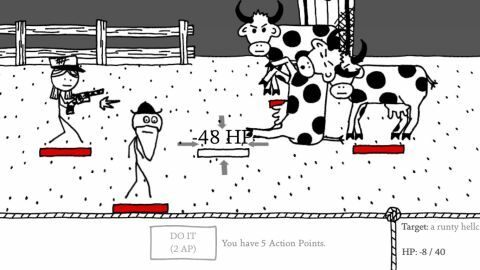 Where West of Loathing falters a bit is with its turn-based combat, which is a relatively simple affair and happens just a bit too frequently. At every turn you'll met angry cowboys, hovering skulls, giant snakes, rabid cult members, and of course the occasional ghost pickle (did I mention you fight them?). Halfway through the game you'll be firing poison bullets from enchanted pistols enhanced with damage buffs from magic boots, and dealing so much damage that most fights will be over with one or two shots or spells. With little challenge for the most part (there are a few tough boss-types and some challenging crowd fights), combat eventually begins to feel like an brief yet somewhat unwelcome interruption to your enjoyable travels. When you lose, there's no real penalty: you can dive right back into the fight, take a moment to buff up, or simply go do something else. It took me about twelve hours to make it through Loathing's main story (with lots of diversions and side-quests along the way), but I played another dozen hours just to continue exploring, to make sure I'd been everywhere and done everything, to unravel some of the RPG's truly strange mysteries, and to solve a handful of remaining puzzles, some of which are admirably elaborate. I had to create a spreadsheet with formulas for one—though maybe you're better at math than I am—and a spare envelope on my desk is now covered on both sides with notes, numbers, codes, and the names of about two dozen dead women (which isn't nearly as grim as it sounds, I promise). West of Loathing is a wonderfully written RPG adventure, both fun and funny from its opening credits to whenever it is you decide you've probably read every last word in the game and realize, regretfully, that you've finished.